A short one today as the Estrellas Poker Tour Barcelona Main Event played down from nine players to a winner in just about six hours or so. The Frenchman Mohamed Samri ended up winning the sucker, kind of a surprise to be honest as there seemed others in the final group more likely to come out on top, including the eventual runner-up Teunis Kooij of the Netherlands and third-place finisher Chris Moorman, the British standout. Moorman started today with the lead, and Kooij -- which we were pronouncing as though it rhymed with “huge,” often referring to him as “The Kooij” -- took it over early on. 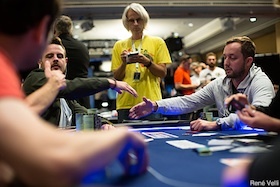 Both had big stacks and Samri was short during three-handed play, but Moorman lost a big preflop all-in with pocket sixes against the queens of Kooij, then lost the rest in the next hand to go out somewhat surprisingly in third. Kooij had the big lead to start heads-up play, but after the last two made a deal it was Samri winning both of the all-ins to take it down. Samri had less than $4,000 worth of tourney cashes before, so the €353,220 score was crazily big for him. And Kooij had no recorded results, so it was huge for him as well. Or should I say, hooij. Got back in the room in good enough time to give my mom a call on her birthday and assure her I was doing fine out here with the long work days and (often) short nights of sleep. Speaking of sleep, I’m moving over to help with Day 1b of the Main Event tomorrow, which has another of those undesirable 10 a.m. starts. I’ve traded off shifts, though, so thankfully won’t be going in until later. Gonna take advantage of the extra hours here and relax some -- more mañana.